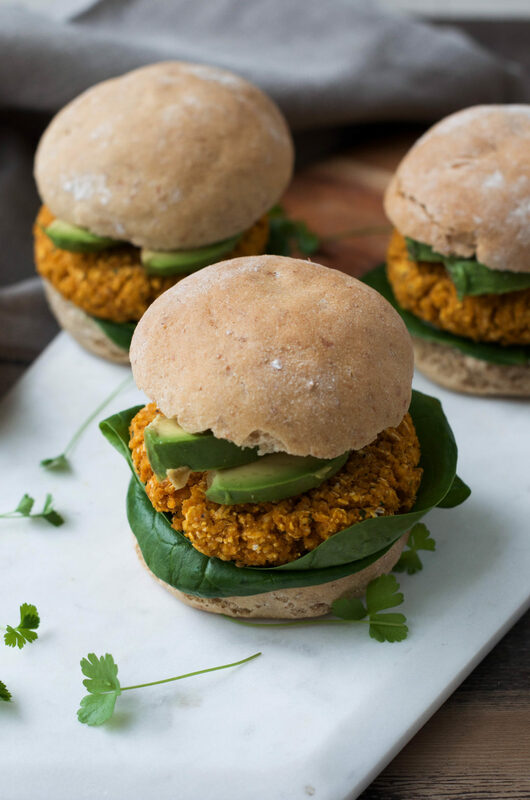 Delicious patties that can be enjoyed in a burger or on top of a salad, these Millet Sweet Potato Burger Patties make a perfect week-end meal. They are also a great option for meal prep ! Who said vegans couldn’t enjoy their own version of burgers ? 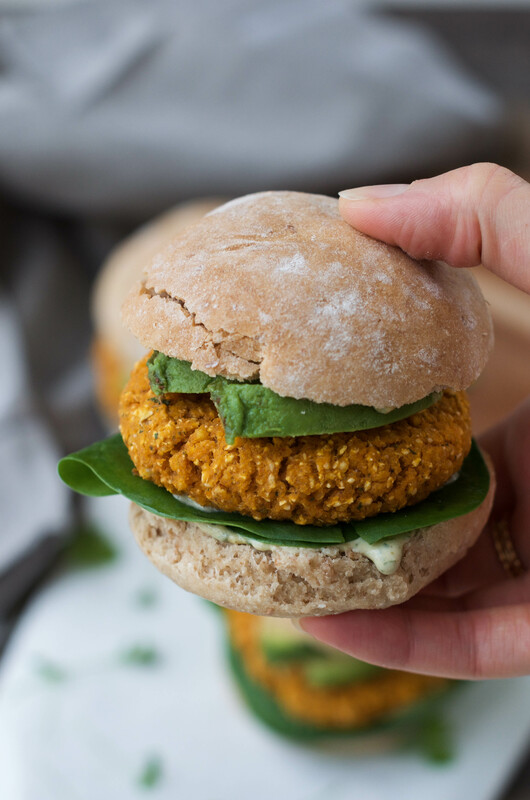 Veggie patties are amazing, and I intend to prove that with these Millet Sweet Potato Burger Patties. I’ve been experimenting with veggie patties for a while and I don’t think I will ever stop. There are just so many variations you could do: switch up the veggies, spices, grains, legumes… Basically, anything is possible. And can we talk about how versatile they are ? Serve them on top of a salad, as part of a buddha bowl, or in a burger with your favorite toppings. Delicious. Every combination. (I may have tried them all). The recipe for these Millet Sweet Potato Patties is pretty easy. However, you do need about 1 hour to prepare them. 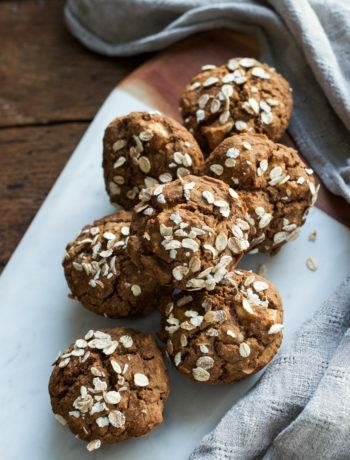 Make these during the week-end, and enjoy them right away, or use them for your meal prep. You could also freeze the patties so you can keep them longer. Simply thaw and reheat them when you feel like it. 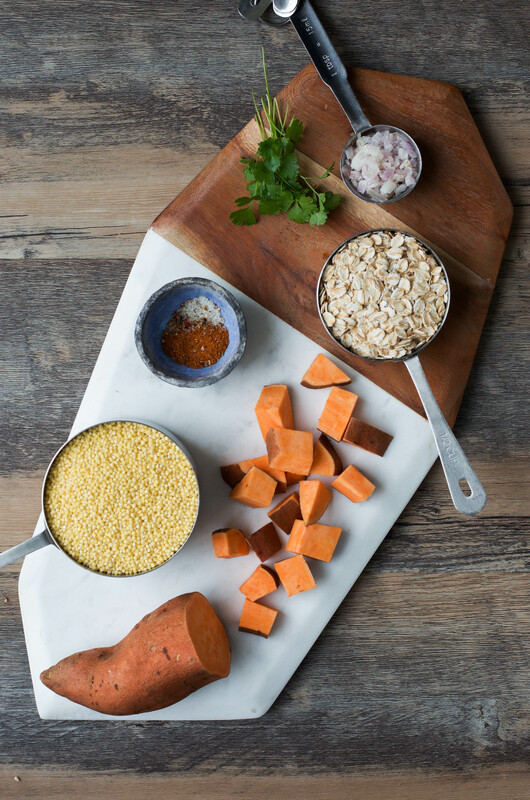 All you need to do is cook the millet, steam the sweet potatoes, and throw all the ingredients in your food processor. Blend, form the patties, bake, and enjoy ! Tender but pretty firm on the outside, sweet (but still savory enough), with just the right amount of spiciness, these Millet Sweet Potato Patties are so satisfying. I hope you love them as much as I do ! Though these burger patties are better fresh, you can keep them in an airtight container in the fridge for up to 4 days. Enjoy them hot or cold (perfect for meal prep). I love having these patties on top of a salad, with veggies, kalamata olives, avocado slices, and a cilantro + tahini + lemon dressing. They are also delicious as burgers of course. A great combination of toppings is baby spinach, cilantro tahini lemon dressing, avocado slices, and some kind of tomato sauce or salsa. If you have sprouts, definitely add them as well ! I bet it would be amazing. 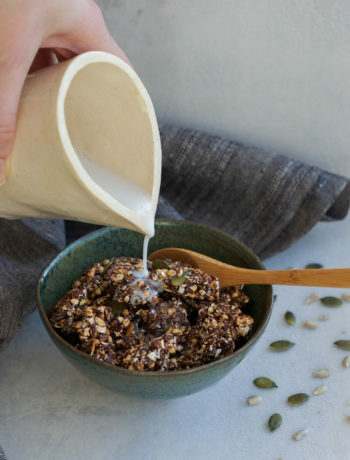 Start by toasting the millet in a non-stick saucepan on medium heat for 4-5 minutes, until it turns slightly golden brown and the grains become fragrant. Stir frequently so it doesn't burn. Add the water with some sea salt, stir. Bring to a boil, then turn the heat on low and let simmer, covered, for 15 minutes, until most of the water is absorbed. Remove the saucepan from the heat, and let it sit covered for 10 minutes (don't stir !). Then, fluff with a fork and let it cool. In the meantime, steam the sweet potatoes until tender. This should take somewhere between 5 to 15 minutes, depending on the size of your sweet potato chunks. Preheat your oven to 190°C (375F). 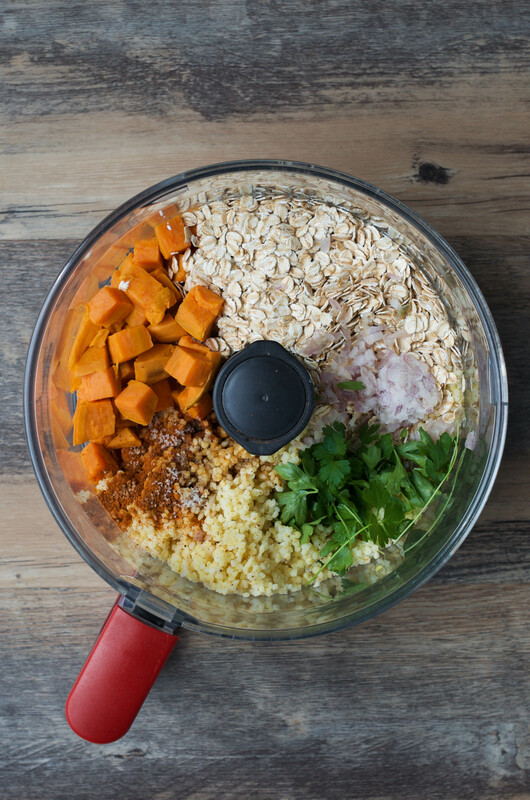 After the millet and sweet potato have cooled a bit, transfer them to a food processor along with the oats, parsley, chopped shallots, chili powder, tamari, sea salt and pepper. Process until it forms some kind of "dough"*. This should take between 15 seconds to 1 minute, according to the food processor you have. Using slightly damp hands, form the patties using 1/3 cup for reference. This will make it easier to make their size even. Place the patties on a baking tray lined with baking paper or a silicon mat. Let the patties cool for a couple of minutes before serving, so they firm up a little bit (don't remove them from the pan right away or they might crumble). Enjoy them on top of a salad with your favorite toppings, or in a burger ! * It's totally okay if there are still chunks left ! It's actually better for the texture of the patties. You don't want it to be completely smooth. 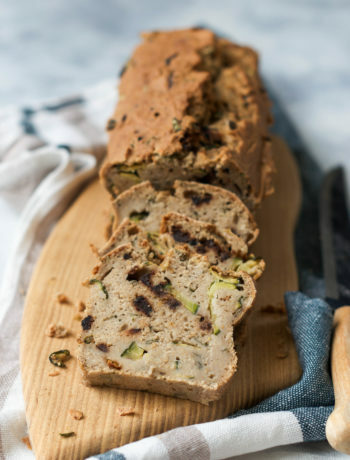 Looking for another savory recipe ? 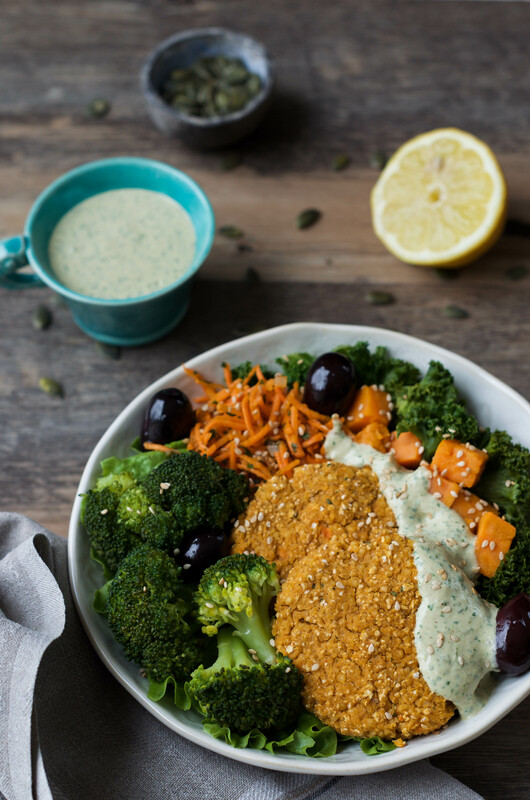 You might like these Veggie Cakes with a Sweet Potato Dip !